Clays for Kids First Place Team: (L-R) Chad Ryan, Jared Roberts, Jared Singletary, Randy Ryan and Renner Roberts (front). The Aucilla Christian Academy Alumni Association is pleased to announce that $35,000 was raised for area students to receive need-based scholarships to attend ACA through the association’s third annual Clays for Kids benefit on September 24, 2016, at Southwind Sporting Clays in Quitman, Georgia, presented by Staunton & Faglie, PL. The best overall shooter at the event was Josiah Bullock who also won the Flush and Flurry Yeti cooler prize, donated by Waukeenah Fertilizer. Coming in first place at the event was the Capital Truck team from Tallahassee, followed by Madison Dental Associates in second place. Other corporate teams included: Big Bend Logging/Services, C.W. Roberts Contracting, Clerk of Court Kirk Reams, North Florida Abstract & Title Company, Southeastern Enterprises of the Big Bend and Vascular Surgery Associates. The 50/50 cash drawing was won by Danny Deason. Participants and their guests were treated to a delicious continental breakfast provided by ACA alumni and the Jefferson County Farmer’s Market with snacks and drinks during the shoot provided by Coke and Quality Snacks and Vending. Lunch was donated by ACA alumnus J.T. Surles, owner of Brick House Eatery, which included: BBQ pork, chicken, ribs, potato salad, and cole slaw with homemade desserts prepared made by alumni and tea in a colorful souvenir cup. “We appreciate everyone who supported our event so very much!” said ACA Alumni Association President Tyler McNeill. Additional donors included: Southwind Sporting Clays, J.D. James Inc., Nature Bridges, KAOS, Caminez Law Firm, Kelly & Kelly Properties, Madison County Community Bank, Randy Floyd, Don Veller Seminole Golf Course & Club, Johnston’s Meat Market, Jefferson County Country Club, Plant Me Green/Simpson Nurseries, and the ACA Ambassadors who did an excellent job serving in the kitchen and as trappers at the 12 shooting stations. To view photos of the event, click here (or click Flickr slideshow on bottom of page). For information on participating in the ACA Alumni Association's Clays for Kids event next year, please contact ACA Director of Development Lisa Flournoy at 850-997-3597 or lflournoy@aucilla.org. 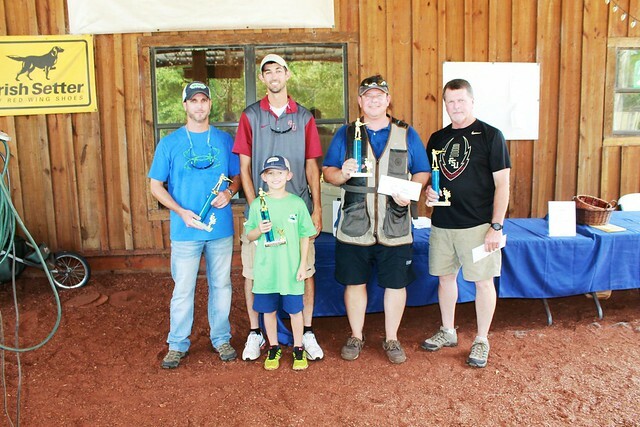 ACA Alumni & Friends' Clays for Kids Second Place Team: (L-R) Clint Rogers, Kyle Rogers, Jeremy French and Kyle Whitaker. Pictured below: Best Overall Shooter and Flush & Flurry Winner Josiah Bullock (left) with 50/50 Prize Winner Danny Deason. Click below to view photos from the event in a Flickr slideshow or here to view the full album.